Many people walk around feeling tired, run down and exhausted most of the time, often relying on various stimulants to make it through the day. One thing that is certain is that these individuals don't suffer from a caffeine deficiency. In fact there is something dysfunctional, or out of balance with their internal biochemistry having multiple vague symptoms for a long duration of time. Unfortunately never being able to arrive at an adequate explanation through conventional approaches and the diagnostics to get a better handle on understanding the biochemical imbalances that apply to all Thyroid conditions. Autoimmune Thyroid disease in a lot of people isn't easily or quickly cured. It is a long drawn out process that requires patience and support from both doctors and the wider community. The symptoms of Hypothyroidism (underactive thyroid) being the most common condition can include: Depression, anxiety, cognition, learning, and/or memory impairment, loss of hair, loss of hearing and muscle tone, uncontrollable weight gain, , heart disease, ,hypo ventilation, psychosis, cold hands and feet, dry skin, fatigue, exhaustion, generalised malaise, restless sleep, occasional blurred vision, watery eyes, chronic sore throat and puffiness of the face, constant flu symptoms, bloating and discomfort, constipation, just to name a few, resulting is widespread dysfunction that can manifest in a variety of ways if cellular metabolism drops too low. Some of the symptoms, of Hypothyroidism as well as that of Hyperthyroidism (overactive thyroid) are vague and diffuse and usually blamed on "emotional" problems. Many of the symptoms are shared by the two predominate Thyroid conditions with an overactive Thyroid usually identified by prevailing symptoms including: Weight loss, hyperactivity and heat intolerance, rapid heart beat, false energy and fatigue, nervousness and irritability,loss of sleep, increased frequency of bowel movements, decrease in menstrual periods. In the case of both an Underactive and Overactive Thyroid, a Chronic Fatigue comes from the inability of the cells to store energy and the loss of reserve energy as the Thyroid being responsible for metabolic rate in all people. As you may imagine, a typical medical approach to such a shopping list of symptoms would be a general focus on symptom control. This is using pain medicines for pain, sleep medicines for sleep, antidepressants for mood tendencies and so on. Unfortunately all the symptoms and variations of a Thyroid problem are common and usually get labelled as individual medical conditions. The great misfortune is misdiagnoses that relates to the encounters found in orthodox medicine and that the medical approach is always reductionistic. That is, doctors tend to treat everything on your list and generally by the book for that matter much like any number of common or age related ailments. The successful management and treatment, of Thyroid disease requires a sympathetic relationship between doctor, patient and particularly spouses. Doctors and friends who display the characteristics of empathy, acceptance of their patient and friend’s suffering, being non judgemental as well as commitment to continued care and support are more likely to maximise the effects of treatment and the general well being of all. It is no longer scientifically or morally justifiable, to argue whether Thyroid failure is "something" or "nothing." What is clearly needed now are clean, randomised, prospective and adequately powered trials to provide unequivocal answers to the lingering but critical questions regarding the effects of Thyroid failure and its treatment on important end points such as intellectual function, ischemic heart disease, and quality of life, not to mention the “Social Impact of Thyroid Conditions”. Could a long standing autoimmune dysfunction have been present for many years ? The longer the period of disease has existed, the more dysfunctional the entire system will have become by the time proper evaluation of the condition has been established and interrelated findings addressed. Where as a long standing autoimmune dysfunction could have been present for many years. The better approach, is to take a holistic view to gain a wider understanding, that is to more clearly define the many interrelated symptoms and biochemical dysfunctions and imbalances that the body concomitantly expresses which limits the individual’s potential health and quality of life. 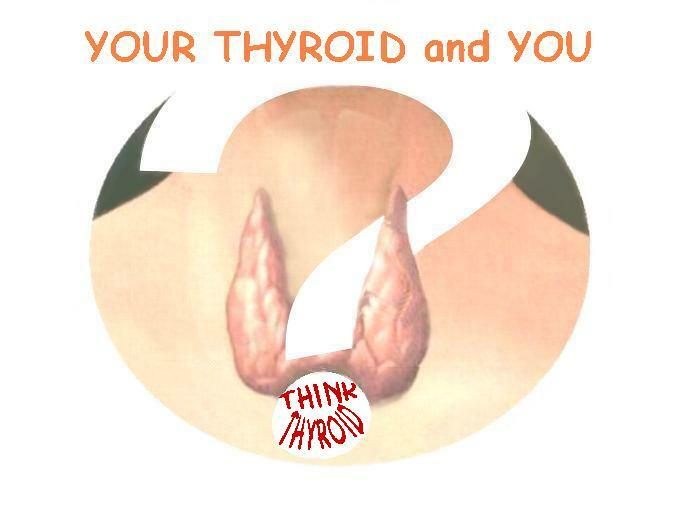 To arrive at a better and more holistic understanding, of an evaluated Thyroid condition, requires a detailed history and examination of related medical records and experiences acquired to date, including a close inquiring look at the results both positive and negative of any tests that may have been carried out conducive to treatment (therapies) that may have been provided. The issue that emerges, as a particularly dominant theme for people with Thyroid conditions is the "Social Impact" relating to their illness. Sufferers generally speak in terms of issues faced in the social world and used their own experience as an illustration. One thing that seems apparent, is that regardless of the condition, each person will have their own fine line to walk. This is an incredulous balancing act that is found very difficult to juggle day by day. For as the doctor feels he has just got the medication right, the patients anatomy undergoes some other curve ball effect only to be thrown off balance, hence resulting in oral medication not always hitting the mark. This is a quandary with which partners and society fail to understand, not to say that those with the Thyroid condition do either. 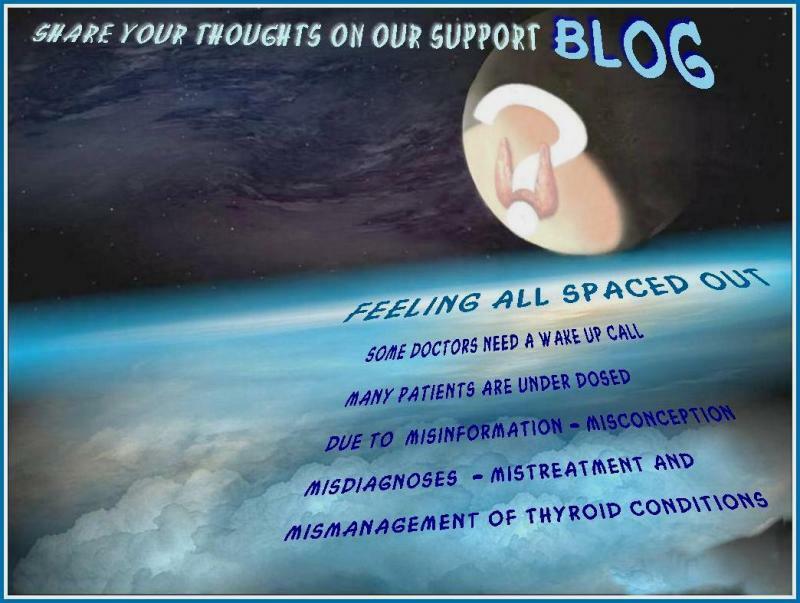 Meanwhile there is a real lack of community and personal understanding, of Thyroid conditions. The wider community does not appreciate that people with this chronic illness have difficulty filling the multiple social roles required of all members of the community. Because they have a life predominate of illness, they have to manage its effects, including the physical, psychological, psychosocial and medical. In reality some live with a fear of the future in which they could realistically become terminally ill. They may described their illnesses as "a sentence" in this case. Another reality is the challenge faced day to day by both Men and Women to get on top of living with a hormonal imbalance caused by their Thyroid condition. To coin the phrase ! “What you loose on the roller coaster you pick up on the merry go round”....... Illustrates the quality of life they have been deprived of and the constant contention they fight with to get it back. In order to avoid living under other people's perceptions, of what may be wrong with them, they feel the need to educate those around them to the fact that having a diagnosed chronic illness is not their priority in life……… but getting over it is. For some the complexity of a Thyroid condition and the underlying problems it causes can make explanation and education a frustrating burden, hence they tend not to bother others with the details. Common conceptions of people with Thyroid conditions, are that they are un motivated, always sick'n tired and lazy, when in fact the opposite is more a realty and wanting to be part of the real world at any time is a major source of motivation. Often on good days or periods when trying to catch up with lost time, problems can occur by doing more than their metabolism will allow, to which usually equates to fatigue and heightened symptoms, so the cycle of feeling like “crap” (for want of a better word) keeps on keeping on. Thyroid disease has no discrimination, with whom it affects and has a strong genetic predisposition. Usually, if you are going to get an Autoimmune Thyroid Disease (ATD) you are going to get it and possibly have it for a considerable period of time before it is properly identified and or diagnosed. Once again this is simply because the medical approach to the acquisition of symptoms is generally focused on symptom control. The education and knowledge, to manage and better understand the experience of a Thyroid condition, is combined with making the appropriate life style concessions, by both the patient and those associated with them. Perhaps the best impact to all facets of daily existence and quality of life for all concerned, is through a supportive approach. What is lost on the roller coaster is picked up on the merry go round provided there is an understanding to work at it.